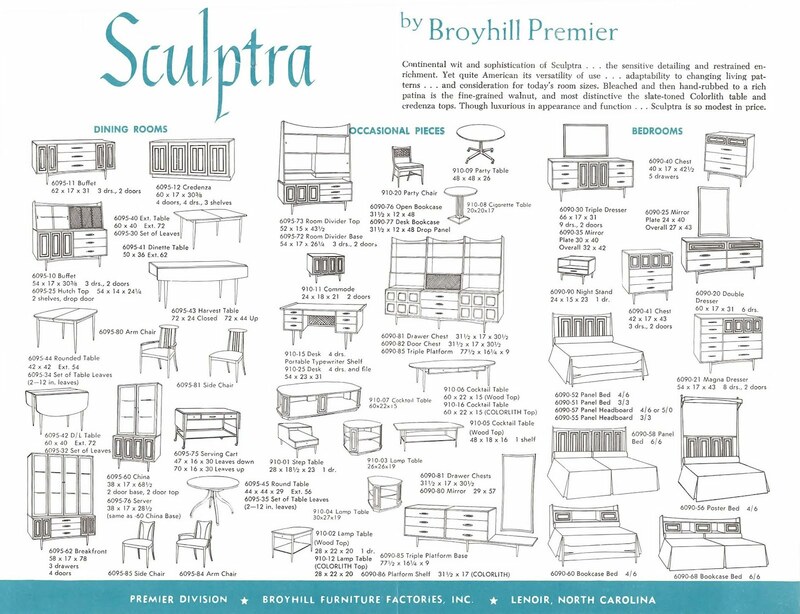 I have been on the hunt for an original Broyhill Sculptra brochure for years. A reader was cleaning out their parents' vintage Broyhill Sculptra furniture and happened to find one in a drawer. And she was nice enough to send me a copy. 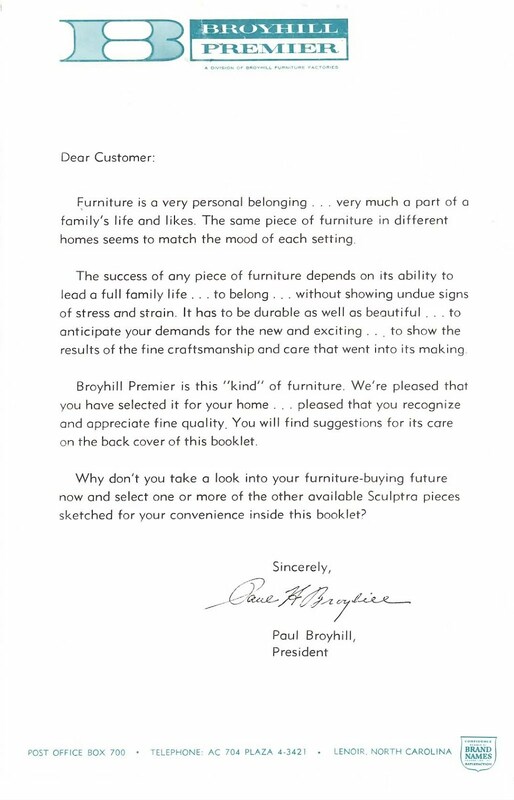 On the front of the Broyhill Sculptra brochure is a letter from Broyhill's President at the time, Paul Broyhill. Furniture is a very personal belonging ... very much a part of a family's life and likes. The same piece of furniture in different homes seems to match the mood of each setting. The success of any piece of furniture depends on its ability to lead a full family life ... to belong ... without showing undue signs of stress and stain. It has to be durable as well as beautiful ... to anticipate your demands for the new and exciting ... to show the results of the fine craftsmanship and care that went into its making. Broyhill Premier is this "kind" of furniture. We're pleased that you have selected it for your home ... pleased that you recognize and appreciate fine quality. 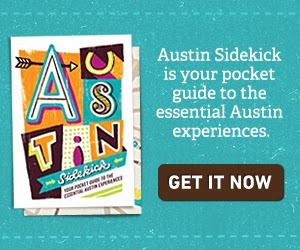 You will find suggestion for its care on the back cover of this booklet. Why don't you take a look into your furniture-buying future now and select one or more of the other available Sculptra pieces sketched for your convenience inside this booklet? On the inside is the original Sculptra by Broyhill Premier line. Continental wit and sophistication of Sculptra ... the sensitive detailing and restrained enrichment. Yet quite American its versatility of use ... adaptability to changing living patterns ... and consideration for today's room sizes. Bleached and then hand-rubbed to a rich patina is the fine-grained walnut, and most distinctive the slate-toned Colorlith table and credenza tops. Though luxurious in appearance and function ... Sculptra is so modest in price. And the back has tips for how to care for your Broyhill Sculptra furniture. The high quality materials and careful craftsmanship which go into Broyhill Premier's Sculptra grouping are worthy of respect. Like anything else, Sculptra will serve you better and give you more enjoyment if you will give it good care. Don't allow wood pieces to touch or sit too near hot radiators. When moving furniture, always lift it, never drag it. Dust lightly ... never bear down ... and then cleanse the beautifully finished walnut grains with a soft cloth slightly moistened with water. This removes dust particles which, tiny as they are, have sharp edges. Wipe the surface dry with a soft, clean cloth. Then polish with a special dull sheen polish which will retain the present soft lustre, such as Johnson's or Old English. Avoid unknown "concoctions" ... and always use a soft, dry cloth. Note how the hand-rubbed finish brings out the charm of nature's chance variations in the color and grain of walnut. In the past, wood was finished to an unreal uniformity. In Sculptra, the natural variations of true grain are preserved and heightened, eliminating artificiality. 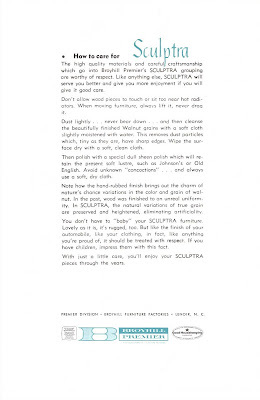 You don't have to "baby" your Sculptra furniture. Lovely as it is, it's rugged, too. But like the finish of your automobile, like your clothing, in fact, like anything you're proud of, it should be treated with respect. If you have children, impress them with this fact. With just a little care, you'll enjoy your Sculptra pieces through the years. 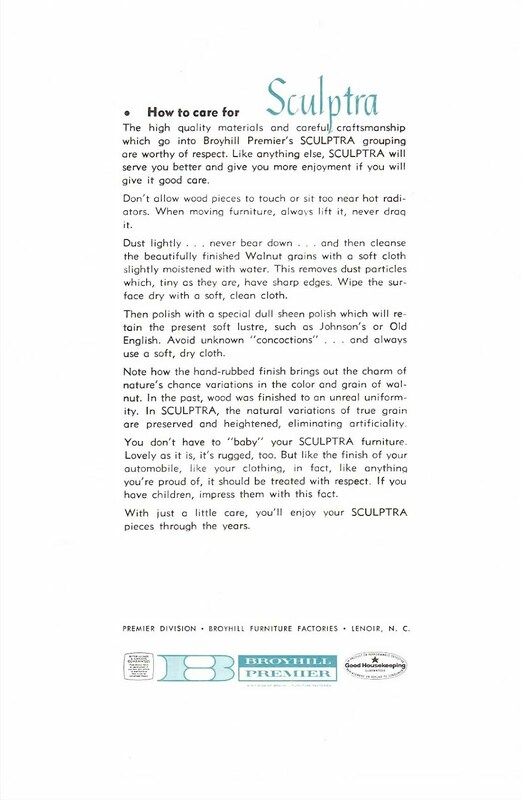 I'm so happy to have the original Broyhill Sculptra brochure to reference. 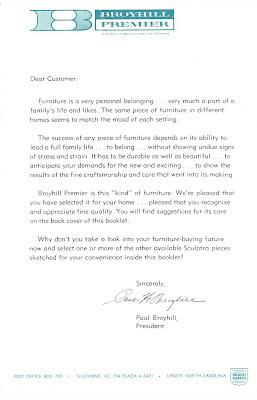 It answers some questions about the line: we can now confirm that there was a Broyhill Sculptra canopy bed but that it was originally called a Broyhill Sculptra poster bed. And you could order a Broyhill Sculptra desk with a "portable typewriter shelf" on the left or a file cabinet on the left. There are also three different Sculptra mirrors. But it also raises some questions, I don't see my Broyhill Sculptra dresser with six drawers; it looks like the Sculptra drawer chests on a shorter platform base. So you may have been able to mix and match some select pieces of Sculptra furniture. And some Broyhill Sculptra pieces had Colorlith top options. Colorlith, according to its trademark registration is, "Inorganic fiber reinforced cement sheets treated for high chemical resistance and adapted particularly for use as laboratory table tops, shelves, drain boards, fume hoods, window stools, and other types of furniture." So that's some pretty heavy-duty furniture. I've never seen a piece of vintage Sculptra furniture with a Colorlith top, so I wonder how popular it was. I will also be using Old English furniture polish or Johnson's polish (which, I'm guessing is now called Pledge) to clean all of my Sculptra furniture in the future. 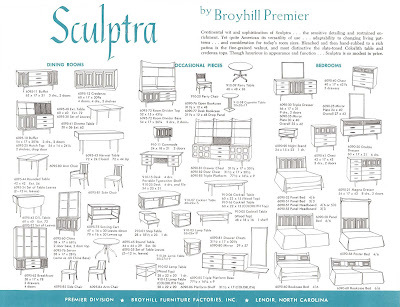 I'm so happy this Broyhill Sculptra brochure is finally in a digital form for the internet to use. Just a few years ago there was little known about the line, and now we're getting close to knowing everything. This is just an awesome find! I love the Sculptra line, so thanks for this. Even found a few new pieces I'd never seen in there. I'm lusting after that 3 piece wall unit!